A "Masou" Shoujo (pun on the word mahou shoujo meaning magic equipment girl rather than magical girl) from a magic world. She lost her magical powers to Ayumu. She is now a freeloader at Aikawa house. She uses a pink chainsaw as her weapon. After Ayumu accidentally kisses Yuki in episode 7, Haruna shows signs of her having feelings for Ayumu. 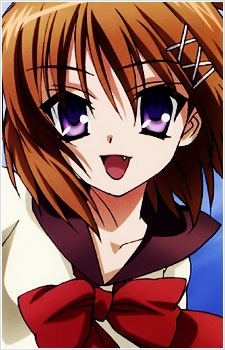 She gets jealous whenever Yuki tries to get close Ayumu or whenever Yuki calls Ayumu her husband. In episode 8, Haruna even asked Ayumu to kiss her just to make him her husband.